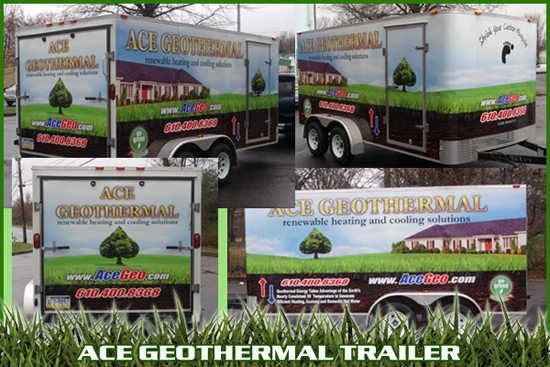 Apple Graphics wrapped a trailer for Ace Geothermal, a renewable heating and cooling solutions company. The client wanted a clean, simple wrap design that would get their message across. So with that in mind, our designers created a 'Go Green' design for this trailer. We were both very pleased with the final product. Check out our Trailer Wrap Gallery for other trailers that we have wrapped! Trailer wraps are a great way to advertise a business. A custom trailer wrap transforms any trailer into a large, mobile billboard. Whether the trailer is being pulled on the highway, or parked at a job site, your business will be advertised. Apple Graphics also offers advertisements on trailers. You can rent space on one of our trailers to advertise your business. It is a great, cost effective way to promote your business and services. Call Apple Graphics for more information on trailer wraps and trailer advertising. Apple Graphics wrapped a 2010 Winnebago View for GoPetFriendly.com. GoPetFriendly.com teamed up with Winnebago to wrap their new 2010 Winnebago View. This Winnebago will be traveling all over the country for years to come. This is the 2nd vehicle that we have wrapped for GoPetFriendly.com. We wrapped a Toyota Rav4 for them last year. The client was so impressed with our work, they contacted us again for this vehicle wrap. GoPetFriendly.com wanted to keep consistent branding across both vehicle designs, so we did just that. Both vehicles have a uniform design and are clearly part of the same fleet. Apple Graphics wrapped the entire Winnebago with a custom wrap design, which included their logo and text content, along with several images of dogs and cats. With a much larger surface area on the Winnebago, we were able to add more graphics to this overall design. We are always looking for that next wrap to challenge our installation skills. We completed this Winnebago wrap and are ready for the next. Apple Graphics' latest project is a 'Three Olives Rangtang' Mini Cooper Wrap. The Three Olives project involved a wrap removal and an installation. The company wanted to replace their old wrap with the new flavor they are promoting, Rangtang. Geek Wraps contacted us with this project. They were looking for a wrap business in the Philadelphia area and located us on the internet. Three Olives is a client of theirs, so Geek Wraps shipped us the vehicle graphics from Florida. Our Wrap Installers removed the old wrap 'Three Olives Bubble' from the Mini Cooper. Once it was completely removed, we prepared the vehicle for the new wrap by cleaning and removing hardware. The new wrap, 'Rangtang', was then applied to the Mini Cooper. Apple Graphics wrapped the entire Mini Cooper, including the roof and light box attached to the top of the car. Apple Graphics enjoyed this Three Olives Rangtang. So for any graphics or sign business who needs a vehicle wrap installation, please contact Apple Graphics.